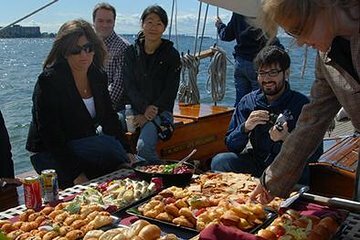 Savor the traditional New York City brunch with a serious twist on this Big Apple champagne sailing cruise. Tuck into a full buffet, complete with coffee, tea and Prosecco. Enjoy homemade muffins, breads and bagels, plus meats, cheese and more. Relax on board as you make your way through the placid waters surrounding the city and take in epic skylines as you enjoy brunch. This cruise is capped at 40 people, which ensures there's plenty of room on deck. Beer, wine, cocktails and soft drinks are available for purchase. This was wonderful! We had some great view of the city and plenty of mimosas. I would recommend this to anyone wanted a different experience over and above a ferry. It was nearly impossible to find the meeting point -- the directions we were given were totally wrong! Fortunately, the boat waited for us while we walked from the designated point to the actual boat after our taxi dropped us off. It was extremely crowded on the boat they packed the deck with people -- and we didn't sail because it was too windy. Nevertheless, the food was quite good and our group enjoyed it. Great experience with exceptional photo ops of the Statue of Liberty. Food was plentiful and high quality. Staff friendly and helpful. At first I was concerned about the unconventional seating options, but we sat near the front and got great pictures! So glad we took this tour! Absolutely loved this tour! Met some fantastic people from all over the place US, UK, even a fellow Kiwi!. This tour was the highlight of my trip. I really recommend it! It's a great sail with around 30 people, in which we can enjoy beautiful views, very good brunch and Champagne. For the ones who like sailing like me, do not hesitate, it's going to be a wonderful experience! The level of this tour is excellent! Beautiful boat, friendly crew, good food, small group of people and spectacular views. Amazing tour, easy to find, ultra relaxing - great staff and a beautiful view of the city. Glasses constantly topped up and delicious food. Definitely recommend. Superbe moment de décontraction cette navigation sur l'Hudson, moyen très sympathique pour une découverte hors norme. Par contre pas facile à trouver la marina, l'adresse n'est pas exacte. Underbar utflykt där vi fick uppleva New York från sjösidan. Trevlig besättning och god mat gjorde turen riktigt lyckad. Kan varmt rekommenderas.